The Fast & Furious franchise now features its first stand-alone vehicle as Dwayne Johnson and Jason Statham reprise their roles as Luke Hobbs and Deckard Shaw in Fast & Furious Presents: Hobbs & Shaw. 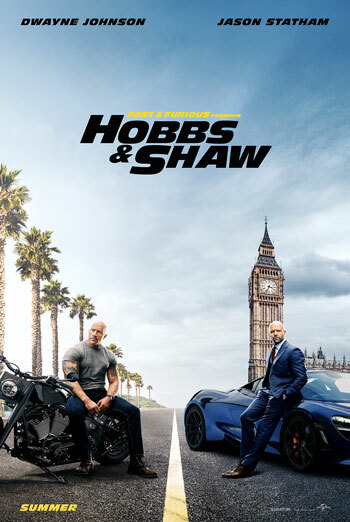 Ever since hulking lawman Hobbs, a loyal agent of America's Diplomatic Security Service, and lawless outcast Shaw, a former British military elite operative, first faced off, the duo have swapped smack talk and body blows as they've tried to take each other down. But when cyber-genetically enhanced anarchist Brixton gains control of an insidious bio-threat that could alter humanity forever - and bests a brilliant and fearless rogue MI6 agent - these two sworn enemies will have to partner up to bring down the only guy who might be badder than themselves.